San Francisco’s “Crookedest” street. The steep, hilly street was created with sharp curves to switchback down the one-way hill past beautiful Victorian mansions. The street is paved with bricks and is an amazing site to see. If not for the byzantine curves, easing out this treacherous slope, people would be killed rolling down. For an idea of how steep this street really is, go two blocks up, to Filbert Street and peer down over the ridge. Lombard is even steeper. The best place to photograph the street, is from Leavenworth Street, at the bottom – looking up. You will see cars headed down slowly, daring souls walking up, and down the sides, while the flowers and buildings provide dazzling color. It is truly an incredible sight. Lombard Street reaches from the Presidio to the Embarcadero. 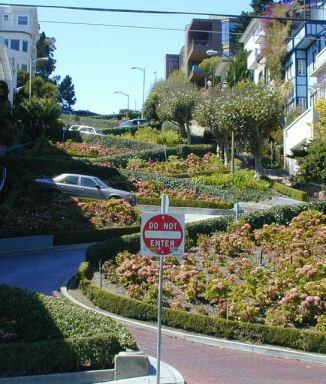 But the short stretch of red-bricked road between Hyde and Leavenworth Streets, which has eight sharp switchbacks, has made Lombard famous. In1922, a past resident and forward-thinker thought up the switchbacks to help pedestrians and drivers deal with the 27-degree slope. There are many ways to enjoy Lombard Street. Cable car fans can hop aboard the Powell-Hyde line and look down the road when the conductor pauses at the top for a few moments. Brave drivers can test their brakes, as long as they’re careful to obey the five mile-per-hour speed limit. Even timid drivers can get a thrill by cutting in halfway at Montclair Street.